Text of conversation between H.H. The Aga Khan and Rt.Hon Adrienne Clarkson at the Global Citizenship Award 2016-09-21 | Ismaili.NET - Heritage F.I.E.L.D. A.C.: Thank you so much for those words. They are so well thought out. And over the years as we have known each other, I am always impressed by your deep sense of humane commitment and a feeling that you have when you talk about things like forgiveness. And that is part of what we are as a society if we are at our best. And that is what makes it possible for us to deal with difference and to deal with the fact that we don’t love everybody. But we have to let people live together. One of the things I am very interested in, and I think everybody here is interested too, is in the fact that you put so much faith in Canada. That you have put institutions in Canada, like the Global Centre for Pluralism in Ottawa which is part of a partnership with the Government of Canada, a very substantial partnership. The Global Centre is redoing the old War Museum to enable it to be a center, a physical center. And you have also put the Imamat in Ottawa. And when I think about it, I think - is that because in 1972, we welcomed so many Ismailis? Was that the beginning of it, or is there something else about us? Is it that you are a secret fan of Mackenzie King? Aga Khan: No, I think the answer to that is that as I look at the world around us, and I ask myself what would define countries where I would like to see my community reside. The first word that comes to my mind is countries of opportunity. And I believe Canada is one of the greatest countries of opportunity. 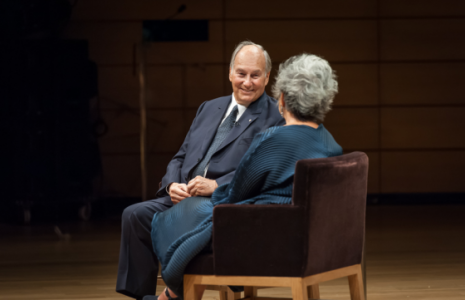 A.C.: I think that is true, and certainly the Ismaili community in Canada has made the most of the opportunities which all people who come to this country have. And that is the reason why I think people understand once they get here, that their lives are going to be different. And that is one of the interesting things too about what you talk about to the Jamat, the community. And I think something that people should realize in the rest of Canada that you have your community, and that’s very important, but that you emphasize how important it is to be part of the world outside your community. And why do you do that? Aga Khan: Well, I have to go back to 1957. In 1957, many of the countries where My community was living were colonies. And those countries needed to go through the process of independence, needed to find the pathways forwards towards peace, towards development. And I have asked myself, how do countries achieve that? And if you go back to 1957, you look at the map of our world, and you try to define where all these countries that have now become independent, have created opportunity, I think one has to say that that has not been very successful. A.C.: What have been the barriers? What are the barriers? Aga Khan: I think there is a multitude of barriers. First of all, I suppose national resources would be a major issue. The second would be the level of human ability within a given country, whether it has the human ability to develop its resources, to build opportunity. So in that sense we are looking at processes of change. And they have occurred. They have occurred. There are today countries of opportunity which either didn’t exist or one would not have thought of as being countries of opportunity in 1957 when my grandfather died. A.C.: And that has changed. A.C.: Well, you have had a lifetime of opportunity to see that. It is very rare to meet somebody who has had such an effect on the world, not only on a group of people, but in the world because that is what you have made it in sixty years. Next year will be your sixtieth anniversary as Imam. And in sixty years, you have seen development, you have made development happen, you have made resources available to places where there were absolutely no resources. And in doing that, it can’t have been easy to decide where that would happen, to decide who would be the collaborators, to bring along people who could understand and have the capacity to help with that development. How did you go about doing that? Aga Khan: I think what you try to do is look at circumstances on an on-going basis. And then you work through, what I would call predictability, and you try to project into the future what countries have the ability to follow the path of peace and development. And where there are situations which are potentially difficult, and that, of course, is something which changes practically every day. And, of course, it’s changed a lot since 1957. A.C.: And they didn’t teach you that at Harvard. Aga Khan: I am not sure what they taught me at Harvard. A.C.: We all wonder what we learned at university and how that was relevant to anything that we are doing today. But I think what is interesting in what you have been saying over the last, particularly over the last decade in your speeches, in your writings, is that ignorance that we have. And I am always struck by the fact that we are, we speak out of such ignorance in the so-called western developed world, particularly about Islam. We do not know the varieties of the Muslim world at all, we seem not to be even interested in it. And the more people shout about it, the worse it becomes, because it is as though we shut out everything that could be various, that could be different, that could have any kind of nuance in it. How do you mitigate against that? Aga Khan: I think probably the first step would be to extract from Islamic history, from Islamic philosophy the great names, the great thinkers, the great astronomers, the great scientists, the great medical figures who have influenced global knowledge. I remember courses which taught general humanities. And those general humanities caused one to read in French, or Italian, or German, or English. Arabic? Never heard of it; Urdu? Never heard of it; Farsi? We don’t even know what that is. So, it was a frightening vacuum in general education at the time. And I think that that vacuum has had terrible results. A.C.: No, of course it has. It is ridiculous. I mean we met only a few years ago, William Polk who was the first translator of the great epic Bedouin poem (referring to the book Passing Brave). And to think that only practically in the in the 21st century did we have access to that translation is frightening almost. A lacuna of knowledge. Not even accessible to us in any way. A.C.: Well, of course, you have given us an enormous gift to Toronto in the Aga Khan Museum and the Jamatkhana, which is now virtually in the geographic center of Metropolitan Toronto. And I think by those wonderful Islamic gardens with the pools of water, but using native Canadian trees, and native Canadian plants. You know I always think of you as somebody with a motto of, “no idea too big, no detail too small”. Because I know how you look at everything, you know, the grouting in the marble, the bulbs that will be planted, the colors of the bulbs. And, of course, that is an enriching thing for you to have that detail in your life. But also I think it enriches us. And when I think of the role that beauty and culture play in the message that you have to the world, I think we are enormously grateful to you. And you didn’t have to do that. People do development and they think it only as health, education and all the U.N categories at that. But you have a Trust for Culture and I have been very fortunate to have been able to visit the wonderful gift that you gave to the people of India for the 50th anniversary of their independence, Humayun’s Tomb. Oh! It was wonderful. And talk about detail. That is a magnificent place which is like a model for the Taj Mahal and the whole place, acres and acres of it was lowered by three feet because that was the original level of the water for the horses. And all the rotten old cement was taken out. And the other wonderful example was in Kabul when I was the Governor-General and Commander-in-Chief, we went to Kabul several times for Christmas to visit our troops when we were there. And the first time we went, we went to Babur’s Gardens, and it was just a disaster. And we wanted to see it because Babur had been the great Mogul king, and we knew he wanted to be buried in Kabul and to see the tomb where the mountains met and the Pass and it was such a mess because the Soviets had left it just dilapidated, a dilapidated part of Western culture. There were no windows in any of the buildings around it. There was hardly any electricity in Kabul, and we were taken around it and they said that the Aga Khan is redoing Babur’s Gardens. And when we went back two years later, the terracing had been restored, the fruit trees and the flowers were started to be planted. And the Al-Azhar Gardens which we saw in the film. All of these, why do you think beauty is so important to us, even when there are so many other needs around? Aga Khan: Well, I think, all faiths express themselves in some cultural form or the other. And Islam is a faith which has expressed itself in cultural manifestations over centuries in different parts of the world. And I think it is very important that those manifestations should be seen and should be, I hope, admired, and that they should inspire young people who are talented young architects, land planners, whatever it may be. So that they can inspire their own buildings with a sense of continuity, but of our time. And I think it is very important that we not try to plagiarize history. I would get a, what would it be, a D or an E at Harvard for plagiarization. A.C.: Well, of course, when you restore things or you make things new, you have to always avoid that. You have to say I am making something new. And that does not seem to fill you with any kind of fear? Aga Khan: No, I think that every people in every given time should be encouraged to express themselves. And I remember that when the Pyramid was built in the Louvre, in the courtyard of the Louvre, there was immense debate as to whether this was appropriate or not. Well, it is there! A.C.: Yes, yes, it is there. When we look at the world today, and of course, you know we have had two and a half days of the wonderful 6 Degrees of Citizen Space, where we had people from different parts of the world, we have had Canadians as well, And we heard very discouraging comments from Europe, from people in Europe who want to make things happen. But the rise of the hard Right, of the really almost Fascist movements, reminds us sadly of times in the 1930s, and we have to really watch that because all of that is to raise fear in people. And once fear rules people, they become blinded to all kinds of things. How do you deal with that? How do we deal with the fear? Aga Khan: I think in this particular case, the issue is whether these countries have been willing to prepare themselves for this situation. Canada is a country that has permanent preparation. It is the way the country thinks. It welcomes people to come from outside. It has the institutions to support them when they arrive. It helps them integrate into Canadian society. That’s not true of many western European countries, because they are facing economic constraint. Because there are social tensions in various European countries also. Northern Europe does not speak the same language as Southern Europe, nor do they face the same problems. So I think we are living at a time when there are real difficulties. And my sense is that they are going to have to be analyzed and solutions are going to have to be found. Because the movement of people is not going to stop. I don’t see that stopping. It is driven by a number of factors. And I think in many of the countries which are sending people to Europe today, are dealing with populations who are seeking opportunity. There is a great sense of lack of opportunity. Opportunity is next door, it is not at home. A.C.: You know when you were named as Imam in your grandfather’s will, he said he felt that he had to appoint somebody who was a young man, a man who was born in the atomic age. That is, the age of the 20th and 21st century. Has that influenced the way you think of things? Do you think of things in terms of a kind of millennial way, because you were appointed so young and you took on those duties so young. You knew you were expected to do something different. That is implicit in that will. Aga Khan: Right. At the time and even today, many of the questions that I ask myself and that I discuss with members of my community is medium and long-term projecting. Where are we going? And are we going in the right direction in various countries? Are we being equitable in relation to the demography of the community? Are we overcommitting in certain parts of the world and under-committing in others? Are there circumstances in regions which make it impossible for our institutions to function? Or, on the contrary, are there countries that would welcome them? So we are looking at, let’s say, a semi-global situation on an on-going basis. So, in that sense, we are looking at how to plan. And planning, I think, in our case requires institutional initiative. We need to get our institutions in place before people decide to move. A.C.: Well, that is the point. You are there before! A.C.: You are there before, because you have to then predict and you have to then say we are going to be out front, and when the tide is ready we will have the port built, so that the ships can arrive. How do you do that? Aga Khan: You pray that Idi Amin never comes back! A.C.: Yes. Well, let’s hope that that was only once in a hundred years, at least. But the idea of a threat to so many people comes up over and over again. I mean we know more about it now, because we have instant communications. So we know when whole groups are threatened, when things happen like that. But, you know, the ignorance that I talked about earlier is almost terrifying. That people do not understand the Muslim world whatsoever. And they do not understand, as you touched on in your speech, they do not understand the differences in the Muslim world. They have never read the Koran, they wouldn’t think of reading it or taking a study course in it. And I think that sort of thing really means that ignorance is promulgated and continued. And then, you know when very careless media add to that. Then you really don’t understand. Also, the other thing that I always like to point out is that Islam is six hundred years younger than Christianity. So, Christians should think, you know, what was Christianity like in the 15th century? And who was talking then? And how were they divided? It is very interesting to think of it in the cycles of history, as opposed to, just thinking, it is now and we are all the same and we are all equal, etc. We are not, really, because we have different heritages. Aga Khan: That is true, but there was also a lot of inter-faith communication in the middle Ages. A.C.: That is right. The inter-faith communication. Aga Khan: A great deal, particularly in the field of mystic faith. A.C.: Linking Sufism and so on with Christian mysticism. Aga Khan: Yes. Personal search. A.C.: Why have we lost that? Aga Khan: Probably, the requirements of modern life. A.C.: Can we do anything about it? Should we be trying? Should that be one of the things we should be trying, besides thinking of development, besides thinking of, you know, creating universities and schools. Can we do that? Aga Khan: I think what we need to reflect over is generosity in society. Our faith, the faith of Islam teaches generosity. But, I think it is very important that generosity should be part of public psyche. A.C.: And that means being brought up with it. Aga Khan: Means being brought up with it. Means recognizing those in need of help. Means creating institutions to deliver that help. And, obviously, in poor countries, it is very difficult to achieve. But it should be a goal. A.C.: Well, the problem is that the gap between rich and poor is growing and growing and growing, and not just in the developing world, but in the developed world. That is one of the real problems now for us, I think, as a society in the West is that disparity between the haves and have-nots. And the more that grows, the more unjust society becomes. And there seems to be very little that people want to do about that. Very little that they really want to do about it. And things become charity. Charity is not the right way to go about it - development is the right vehicle surely. Aga Khan: Yes. Well, in the faith of Islam the best charity is to give, to enable an individual or a family to become independent of their economic destiny. That is known as the best charity. A.C.: How often is it? Does it happen? Aga Khan: I honestly don’t know. I had have to ask our Bankers. A.C.: As a final thing, I would like to ask you. What you really think will happen now in the medium term for our future as we see Britain wanting to leave Europe, as we see the rise of the very hard Right in the European countries, as we see what’s happening in the United States, which is hardly even mentionable? What can we hope for now? How can we as individuals who really want to make things better, as we are faced with all of this, how does it happen, for us now? Aga Khan: I think we have to offer rational people, options. I think it is very important to put in front of public opinion, good options. Alternatives. A.C.: Different ways of behavior. Aga Khan: Different ways of behaving. A.C.: And how do we do that? How do we make that? Is that through education? Is that through incentives? What is it? How is it done? Aga Khan: I think it is through men and women coming forward to take positions of leadership. I think it is institutions who need to engage, rather than let the field open to anything. And, I have been very impressed since 1957 in developing countries. When elections had to be held or were held in circumstances where you would assume that the population didn’t have access to the information they would have, in our view, needed to express themselves rationally and competently. Well, I got it wrong. They are very, very wise. Public wisdom is not dependent on education. A.C.: You are practically talking about Jung’s collective unconscious there. Is that, that there is a kind of wisdom that people share? A.C.: Because of their common humanity. Aga Khan: Because of the common humanity. Because of the common circumstances in which they are living. A.C.: But does that bring us hope, as, you know, a collection of your speeches as “Where Hope Takes Root”. Is that where hope will take root? Aga Khan: Yes. I believe so. But it means that decision makers have to be responsive. A.C.: Well, it is very discouraging often when you look at the people who are elected in public office in different countries and the countries seem to vote for people that will harm them the most. Often, this is the most discouraging when you see in a democratic situation, even in free ones, where people will vote for something that is going to really harm them. And they don’t seem to realize that. It is very, very difficult. Very difficult even because we have freedom of the press, we have enormous freedoms, particularly in North America and most of Europe. We have all those freedoms and yet we are in the dilemma that we are. Does that come back to the individual and their ability to do things? Aga Khan: I think it comes back to the way the individual, or the family rather than the individual, evaluate their position in society at a given time. Ultimately, the basic issue is how does a family feed itself and educate its children, generation after generation? It is that clear. It is that important. And if society is able to provide that for the totality of the population in a given country, that’s already a very sound foundation. But that is a condition sine qua non for a country to move ahead. If you have pockets of poverty, if you have populations or groups of populations who are marginalized, you are looking at a series of issues of when they are going to blow up. The predictability of crisis, in my view, in Third World countries is much higher than people would believe. A.C.: You could predict them. Aga Khan: You can predict them. A.C.: Then why do not we avert them? Aga Khan: Ah, that is a different question. I think predicting them is something that you can do. Averting them does depend on a lot of different issues. That is not always easy. A.C.: Thank you so much, Your Highness.